And entertainment I love, often playing games just for fun. Nothing’s wrong with this, and games as entertainment are both as important and legitimate as any other form of entertainment, be it movies, cartoons, TV, music or books. So much for my speech in defense of the fun in games. Games can certainly be used for many other purposes than pure entertainment. This is hardly a surprise, as no medium is confined in fulfilling a single purpose. Furthermore, even though the different media offer different affordances, we as users of media constantly negotiate the potential scope of application for any one medium. Games may even make use of a particular interpretation of the good ol’ discipline of rhetoric, namely the procedural rhetoric. The term is coined by “videogame researcher, critic, and designer” Ian Bogost in the book tellingly titled “Persuasive Games” (read the article “The Rhetoric of Video Games” if the book is too much). Bogost is very interested in the way “games make arguments” and in turn work to “persuade the player”. Could a game persuade you? To think differently? To vote differently? To change your perspective on the world? To buy another brand of milk? Video games do not simply distract or entertain with empty, meaningless content. Rather, video games can make claims about the world. But when they do so, they do it not with oral speech, nor in writing, nor even with images. Rather, video games make argument with processes. Procedural rhetoric is the practice of effective persuasion and expression using processes. 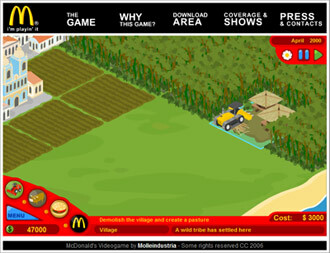 As an example Bogost refer to the recommendable and thoughtprovoking “Mc Donald’s Video Game” by ever-controversial Molleindustria. At first glance many people would probably disdain this as an “interactive commercial” trying to make us buy more lousy burgers. This is not the case. Instead the game makes you play out a scathing criticism of McDonalds; the way they exhaust agriculture, artificially fatten cattle, and perform extensive corruption to silence opposition. By actually forcing us to take part in the processes (claimed by the game to be) behind the success of McDonalds, it soon becomes clear, that the game is actually criticizing everything about this corporation. Such is the procedural rhetoric, and very convincing it is. These games are actually trying to challenge our perceptions, change our minds, call to action. We might call label them “serious games” – games with a purpose other than pure entertainment. In my recent book Persuasive Games, I called the deliberate construction of an unwinnable game the “rhetoric of failure.” Such games present a scenario that can’t be won under the rules provided. These games make a statement about those rules, arguing that they are insufficient for the task to which they are currently being put. Mentioning war above is no coincidence, as several games have commented on or criticized some of the ongoing wars. Gonzalo Frasca, who is known as father to “newsgaming“, has developed a couple of games commenting on the war against terror. His “September 12th” is a rather well-known simulation supporting the idea that bombing for peace is like…well, you know. Not a good idea. It works really well, and if you haven’t allready been there – go try it out. 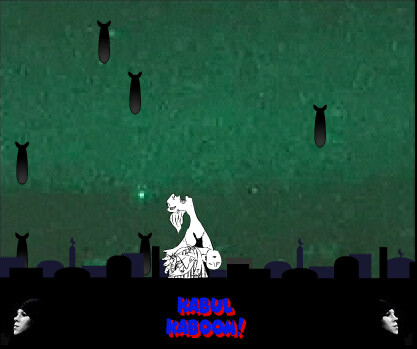 An earlier game from Frasca is also worth a mention, namely that known as Kabul Kaboom!. It is very simple and with…let’s call it “rudimentary aesthetics”. The “looks” serve the purpose of the game quite well, however. You are instructed to “get the nice American food, but avoid their missiles” and told that there is no chance to win. This is explicitly the rhetoric of failure, which is only further reinforced by playing the game. You may manage to eat a bunch of burgers (what’s with all the burgers in these games? ), but eventually you eat a missile and die. Bad luck. You are left dead, but with a very clear idea that it might be a bad idea to drop burgers and missiles in one badly organized mess. 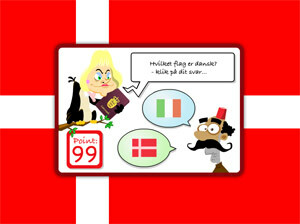 A last example (and the one which got me writing in the first place) is a tiny Danish game critisizing a new agreement made in the Danish Government. The agreement states, that all refugees wanting to be granted a residence permit must first obtain 100 points by working, learning Danish, doing volunteer work etc . This in itself sounds much like a game, but would probably be considered too hard to be playable. The aforementioned game is called “100 points“, and requires you to answer the three final questions before reaching upon the magic 100. The two first questions are easy (if you know Danish, that is – the lower answer is allways right), but in the logic of “the rhetoric of failure”, the third and final question cannot be answered. You are laughed at, but the answer always eludes you. The game is simple, yet the argument is unmistakingly clear. It is considered impossible to ever obtain a residence permit with this system. Agree with the argument or not, it is an interesting use of the medium. I am a big fan of legendary Bob, and it sure is thought-provoking to see a match between the purpose of an old song of his and a brand new game. Are video games the new protest song? The times they are a-changin’, but some things never seem to change.